Exporting to games often exports the viewed time-range only - so you can easily export multiple time-ranges using TimeRanger. Time ranges can overlap and you can have as many as you need. 1.Edit button - You can edit the time ranges and set up your own view per time range (camera or viewport). View Editor below. 2. 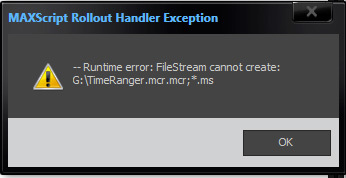 Insert - place the TimeRange code into the file - so when the file opens TimeRanger pops up with the corresponding time ranges. After Inserting you need to save the file. 3. Remove - removes the code form the file. Save to take affect. 4. Load - closes the current TimeRange and loads up the currently embedded time-ranges that are saved in the file. 5. Export - exports Time-Ranger as a new Maxscript with the new Time-Ranger list. 1. Choose a Time Range. You can replace the chosen one, delete it, or add a new one after the selected one. 3. Start and End frames of your Time-Range. 4. Desired viewport or camera. 8. Sort the list of Time-Ranger by frames. 9. Apply changes and go back to the main window. Insert and Save the file for changes to occur. Tested on 3DSMax 7-9. Partly on 2008-2011 - needs to be updated. Submitted by jgk1981 on Mon, 2015-02-09 06:55. Nice tool you have made. But i cant export the animation list in order to load it next time i open the scene. it showing me this error that i have been attached. any chance that will be an update for max2014 and2015?